This cosy apartment at the garden level of a Provencal Villa, situated on the golf of Saint-Tropez, is exactly 300m from the beach and all shops. 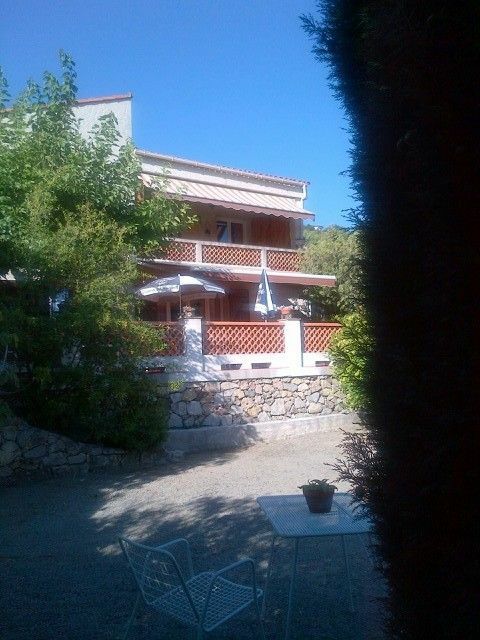 It has a large terrace around 100 m2 with barbecue and a cour ideal for 'petanque' amateurs. You leave your car at the house and you do everything by walk: going to the beaches, restaurants, shops (bakeries...), diving club, boat shuttle to go directly to Saint Tropez. Facilities: - At 300 metres from beaches (private or public beaches). - Diving centre: people who enjoy or wish to discover diving activities, a diving centre is situated at 3 minutes walk from the house. Please ask for further details. - Golf: a golf course is at 10 mns by car from the house. Please ask for more information. - Open air market every Monday morning near the beach (whole year). - A night market every thursday evening near the beach (July and August period). - Concerts and children 'animation' organised once a week in the village (July and August period). You can leave your car in the house and do everyhting by walk or bicycle if you rent one or boat shuttle . Transport: Boat shuttle every hour from the port (5 minutes walk) to: Saint-Tropez, Sainte-Maxime,Porquerolles, Les Iles de Laurens... For more transport or touristic informations, please just ask. I have been travelling a lot, discovering new countries and culture. I leaved 4 years in Edinburgh, Scotland and loved this country and people. 1 year in Spain, a fabulous country. I will make sure you arrive in a confortable place with all necesary equipements. Les Issambres is marvellous place on the French Riviera, very close to Sainte Maxime and Saint Tropez. A perfect place to discover la "Cote d'Azur" with all its beautiful villages and activities, in a quiet surrounded property. In summertime, it is impossible de drive or park in those villages. Our property allows you to do everything by walk. Also if you want to to St Tropez you will take the boat shuttle at 3 minutes from the house, never using your car. This way you will avoid to spend your holiday time in traffic jams, or to be stressed because you cannot find a place to park for your "croissant or baguette" for your French breakfast! The house is surrounded by trees and flowers, birds, a very calm area to have relaxing holidays. The perfect area where to rest. You can leave your cars in the house, and go to the beach, shops, diving by walk. St Tropez is at 20 mns by boat taxi (5 minutres walk to reach boat taxi from the house). Sunloungers, sun umbrellas, barbecue provided on the terrace. Large terrace with large table and chairs (for 8 people) and sun beds - place to play 'pétanque' in the garden as well. A Spa centre (massage, indoor swimming pool) is stuated at 3 minutes walk from the house . Golf: Sainte Maxime Golf is situated at 5 minutes by car from the house.